In 1837, John Lee Williams, who selected Tallahassee as the site of Florida’s capital, stated that “Wakulla Spring is one of the finest springs in west Florida or probably the world.” The National Park Service designated the spring as a National Natural Landmark in 1966 because of its outstanding natural values. Wakulla is one of the largest springs in the U.S and is the terminus of one of the longest and deepest cave systems in the world. Hydrologist Dr. Todd Kincaid states that if the Wakulla caves were not underwater, the extensive cave system would likely have been designated a national park. 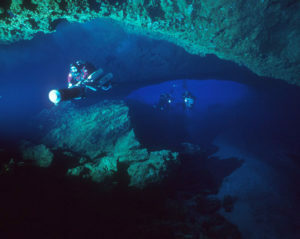 A team of highly skilled cave divers have explored and mapped 32 miles of the cave system during the past 20 years setting world records in the process. Approximately 400 million gallons of water flow from the spring daily creating the nine-mile Wakulla River. The spring is fed by a 1300 square-mile basin (or springshed), the largest spring basin in Florida. Wakulla Spring and River used to be one of the finest wildlife observation areas in Florida, having abundant wading birds, waterfowl, alligators, turtles and fish. Manatees have become common during the winter since 1998. The wildlife is easily seen during the river boat tours. 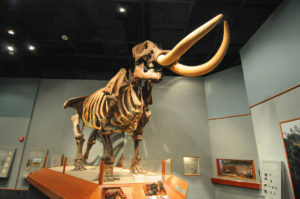 Bones from prehistoric mastodons have been collected from the spring cavern and are on display at the Museum of Florida History in Tallahassee. The crystal clear water of the spring provided a natural movie stage for eight films from 1941 to 1976 including the Creature from the Black Lagoon, Airport 77, and Tarzan films. 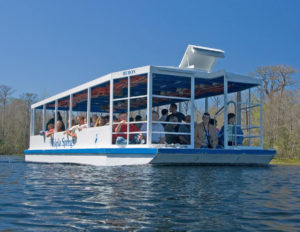 Glass bottom boat tours have been part of the culture of the spring since 1875 when local black men used a row boat with a window pane sealed in the bottom and a canvas shade over the top of the boat. The fee was 25 cents. The Lodge was built in 1937 by Ed Ball who owned the property over 50 years. The state of Florida purchased the property and created the state park in 1986. Approximately 250,000 visitors a year enjoy the park, many of whom are international tourists who are in awe when they see this massive spring. The state park provides swimming, picnicking, nature trails and lodging generating approximately $22 million per year for the local economy. Wakulla Spring is Florida’s “Capital Spring” being only 15 miles from the state Capital. It has hosted dignitaries including the Shaw of Iran, King Hussein of Jordon, Florida’s last 20 governors, Jane Fonda and Ted Turner and Tarzan, Jane, and Boy. It has been part of the local culture for over a century with local churches conducting baptisms in the spring, school picnics, and weddings, the FSU Tarpon Club women’s synchronized swim team and a U.S. Army haven during World War II. B.K. Roberts, a former chief justice of the Florida Supreme Court, stated that any candidate that didn’t announce his candidacy for governor at Wakulla Spring stood little chance of being elected. “We take all of our visitors to the park, which I view as one of the most beautiful spots on Earth, and I have been around the globe.” Editor, Tallahassee Democrat 2012: Wakulla Spring is a very special place.